Effects: strong analgesic and anti-inflammatory properties; psycho-stimulating, antispasmodic, tonic, blood purifying, immune stimulating, appetizing effects; active against alcoholism, causes disgust to smoking; well-pronounced antiseptic and antitoxic effect, it is especially effective against headache and migraine, physical and mental fatigue, fungi, stomachache; it regulates the climacteric hormonal balance. Benefits: The Milfoil essential oil contains azulenes which contribute to its blue color and anti-inflammatory properties. Its main application is in healing open wounds and ulcers. It is recommended to be used in long-lasting diseases, eczema, allergic skin reactions and it is suitable for oily skin types and acne. Suitable for balancing the functions of the respiratory and digestive systems. Commonly used for colds, bronchitis, pneumonia, sleep disturbances, rheumatism, arthritis, gout, psoriasis, hair loss, bleeding, gum disease, mouth bad odor, cystitis, predisposition to alcoholism and smoking, vaginal infections. 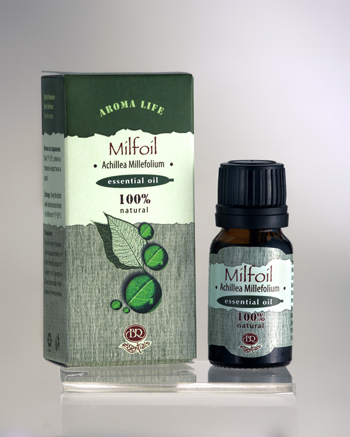 The Milfoil Essential Oil is appropriate for spirit enhancing, having a revitalizing effect and strengthening the spirit. It helps maintaining the balance of intellect and creativity. Attention: Oil with a strong action! Contraindicated for epileptics, hypertonic, after heart attacks, people with individual intolerance to Milfoil essential oil, nursing mothers, pregnant women and children. It is not recommended for sensitive skin. Overdosing of Milfoil essential oil can be toxic, resulting in dizziness and allergic reactions. Do not use before exposure to direct sunlight! Phototoxic!